Stained Glass Windows are a beautiful addition to any home and can be used in any room of the house. In most of the cases we have seen, our clients are seeking some privacy, so the bathroom stained glass and entryway stained glass are extremely popular areas for installation. These areas are great to have natural light stream through, however not wandering eyes looking through. Therefore, stained glass is a great alternative since it provides a solution to both of those issues. In your entryway, the windows beside your front doors, sidelights, are typically long and narrow and are another great area to install stained glass. Homes that have higher ceilings often include transom windows above the main windows. These small outlets allow for more light to stream into the home, however, they are sometimes very oddly shaped. This can pose a design dilemma when trying to figure out shades or privacy for that area. Shades will defeat the purpose of having a window there since they will always be closed (who wants to climb up to open and close them everyday?). 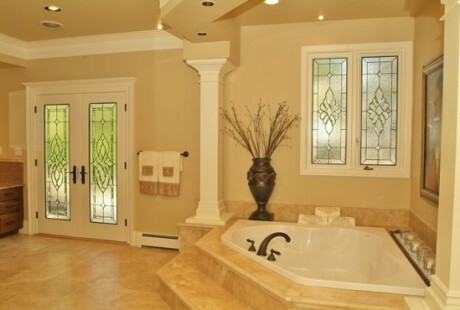 Stained glass can be a perfect option for this area – privacy and light! Another area that benefits from stained glass is the kitchen. The kitchen of your home draws the most people and is used for entertaining almost everyday, whether it be with your family or friends, chances are you are there at least once during the day. Having a beautiful piece of stained glass can be a great eye catching piece and focal point. Not only are windows an option in this room, but kitchen cabinet doors as well as ceiling stained glass fixtures are very popular and something to think about. Religious Stained Glass can be used in Churches and Temples and has a different look and feel from the typical residential stained glass you see. Religious almost always uses a lot of color and is much more intricate than pieces you will find in one’s home. Traditionally, Churches have wanted complete privacy in their sanctuary and colored glass achieves this goal. 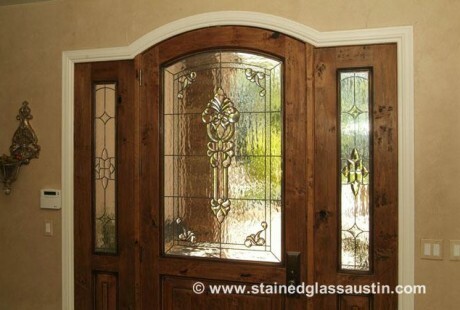 Austin’s Scottish Stained Glass has noticed a great shift in the styles of stained glass. Traditional beveled designs, antique style designs and contemporary designs are still popular, however Celtic designs and Prairie stained glass are jumping in the ranks. Commercial Stained Glass is very popular among restaurant and hotel owners. Often times, you will notice stained glass between table booths, in the entry doors, on entryway doors and on the ceilings or light fixtures. Stained glass is a great way to add some character and design aspects to your hotel or restaurant. Scottish Stained Glass is proud to serve the community of Austin, Texas. Contact us for any questions you have or for the beginning stages of your stained glass project.